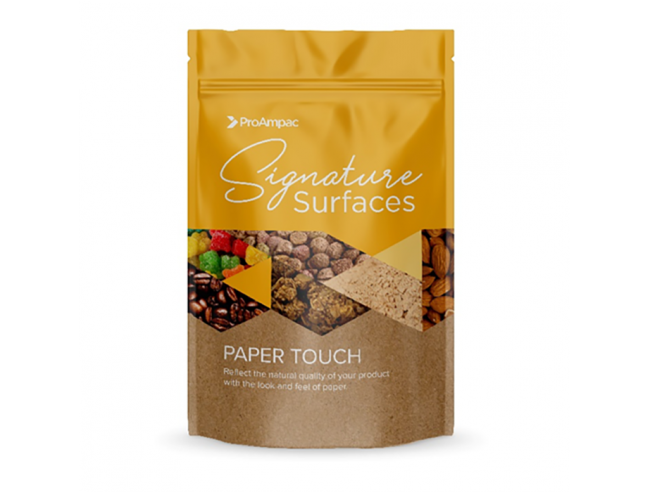 ANAHEIM (March 6, 2019) – Exhibiting at Natural Products Expo West, ProAmpac is demonstrating its recyclable flexible packaging portfolio and showcasing its new Signature Surfaces offerings– packaging films that provide consumers a distinctive tactile experience when they handle a product. ProAmpac is also showcasing the company’s short run production capability that can accelerate shifting from rigid to flexible packaging prototyping and design. ProAmpac is exhibiting at booth N-1817 March 6 through 8 at Natural Products Expo West in the Anaheim Convention Center. “Natural Products Expo West is a magnet for entrepreneurial producers of natural, organic and healthy products, many of them being small and growing firms. We invite these companies to explore the sustainability and convenience advantages of flexible packaging – even in small volume, short run production quantities,” said Adam Grose, chief commercial officer. “We have in-house design capability that helps customers develop distinctive flexible packaging formats. Combined with our short-run production capabilities and our suite of ProActive SustainabilityTM products, we can help the most ambitious and discerning firms with their packaging design innovation,” he said. ProAmpac is also showcasing 100 percent recyclable films with standard and high-barrier options. These films are part of its ProActive Recyclable product group, which includes stand-up pouches; quad-seal pouches; rollstock for form/fill/seal applications; sandwich wrap, retail handled shopping bags, and more. “Recyclable packaging is one part of our ProActive Sustainability™ commitment,” said Grose. “This strategy means being a good neighbor and looking to the future. Using advanced technology, ProAmpac is developing and innovating sustainable flexible-packaging products. “By reducing energy use and the environmental impact at its facilities, ProAmpac is engaging employees, collaborating with suppliers and customers, and teaming with neighbors to make the communities in which we operate, as well as the packaging we make, even better,” he said. ProAmpac is a leading global flexible packaging company with a comprehensive product offering unparalleled in the industry. We provide creative packaging solutions, industry-leading customer service and award-winning innovation to a diverse global marketplace. We are guided in our work by four core values that are the basis for our success: Integrity, Intensity, Innovation, and Involvement. Cincinnati-based ProAmpac is owned by Pritzker Private Capital along with management and co-investors. ?For more information, visit ProAmpac.com.